Monuments pretend to exist outside of time. They are stone feats of engineering, designed to outlast us. 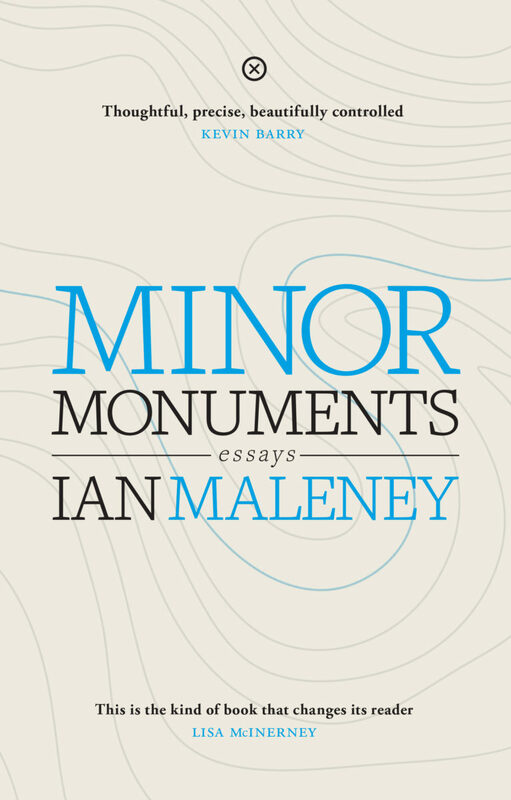 Ian Maleney’s debut collection of essays, Minor Monuments situates the figure of the monument as something more immaterial and ephemeral, a fragile link between disparate moments in time. Maleney’s essays explore long paths of intertwining narratives: the last years of his grandfather, John Joe, who is losing his memories due to Alzheimer’s, his grandmother’s experience as anchor and caretaker, and his own changing relationship with his home and past. Throughout these narratives he weaves meditations on memory and its imperfect records, the temporality of place, and, perhaps most importantly, listening. The power of the collection is its ability to cross and recross each of these threads throughout the trajectory of the book, circling back to form new knots of realization. 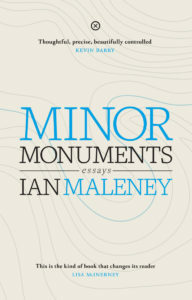 The essays are largely situated around Maleney’s family farm during the author’s early to late twenties. Although he lives in Dublin, many of the essays are occasioned by his return home to the country, where he reaches back toward earlier events to make sense of the present, a distance always untraversable, despite his careful and vividly rendered attention. Recording — in all of it is meanings — is essential to the project of Minor Monuments in general, and the attempt he undertakes to record his grandfather in particular. He writes that in the beginning he thought of recording his grandfather as a type of listening in order “to record that person still forming as he began, contrapuntally, to unravel.” In the time that Maleney spends with his grandfather, he describes sitting in the kitchen and attempting to fill a silence, to fill time that “just wouldn’t pass.” They play drinking songs and Irish ballads on an old CD that skips, and John Joe sings along. John Joe and Nana, his grandmother, are vivid, detailed presences throughout the essays, a reminder that the author’s explorations of memory are far from distantly abstract. Over the course of the book Maleney traces his shift from understanding the goal of recording as its product to treating the process of recording as its own goal: lying motionless in bed, trying not to make noise; standing in the bog, his mind quieting and emptying; turning on his phone’s voice recorder while he spends time with his grandfather. Recording expands minutes into a feeling of hours. It demands hyperattention in the present. In “Fidelity,” he writes: “If I have tried to capture anything with my microphone and my recorder, it is that time when time itself is changed. I want to listen back and hear myself transported. I think that if I could get it just right — if I hold the microphone steady, if I barely breathe at all — one time would fold seamlessly into the other, and extinguish itself.” Recording for Maleney is the fold in time that bends toward the unrecoverable past. It is to face the infidelity of recording, and more than face it, but to record the infidelity itself. In the second essay in the book, “Below,” Maleney explores the experience of the past in the spaces we return to, and the paths that accumulate through generations of experience. He describes his grandparents’ house as a place “where the past lives as a peaceful tenant of the present.” In Maleney’s writing, the house continually acts as portal, as the essays layer the author’s own memories with the stories of his parents and grandparents. The house resonates with the stories experienced there, shaping and directing the present, in devastating contrast to John Joe, whose stories and memories are disappearing. Unsurprisingly, in part because this is a book set in the Irish midlands, in part because it figures so strongly in the landscape of Maleney’s home, the bog is a leading figure throughout the collection. Drawn by its quiet, he is often recording the bog, attempting to capture the sound of the wind. It is the place in which he first seems to realize what he is listening for. It also acts as a figure for understanding our relationship to history. The essay “The Blow-In” begins with a family visit to Boora, a bog near his family’s house, and quickly moves back through the history of peat harvesting, and the complexities that shape the region’s culture. Maleney quotes Tim Robinson, whose fascination with the bog is “the way it both remembers and rejects the paths we make.” The essays are their own tracing of paths, as Maleney navigates his relationship to home, to his family, and even past versions of himself. Like all places in Minor Monuments, the bog is always a site of heterotemporality, a site where we remember that the time we live in is a complex, layered assemblage of the time that has come before. It is not a passive feature in the landscape but a site that shapes interactions. Maleney writes: “The bog is not an end-point at the edge of the human world, nor a stratum beneath it, but an environment shaped by the ongoing wanderings of people coming in and out of it. To traverse the bog is to beat a path through it, leaving a trail for others to follow, or following those who have gone before. Such a path is always communal; some sense made of the wilderness over time.” These paths are the paths of memory, the paths of our intersections with other people. They are the way that we narrativize the wildness. It is through his noticing, through the attention, that we can form thread out of the wilderness, and Maleney’s writing is obviously a product of this careful attention. It is impossible to follow these paths of abstraction in Minor Monuments for very long without returning to his grandfather’s loss of memory. John Joe becomes disentangled from his family through the loss of recognition and awareness of time. How can we understand ourselves, our place, without an understanding of where we are and what has come before? The disorientation and fear of his grandfather makes Maleney’s attention in the present all the more urgent. What is most striking about Minor Monuments is that, despite its impulse to preserve and record, it makes room for silence. In the penultimate essay, “A Deathly Thing,” he describes caring for a person with Alzheimer’s: “As the usual bonds of recognition and connection are broken — as memories fall away, as activities become impossible, as conversation is reduced to silence — there remains the burden and duty of saying: I see you. Against the creeping tide of the disease, we are asked to find the previously invisible, unacknowledged commonalities, the slivers of life and being which, too faint and unimportant for everyday notice, nonetheless persist after the louder noises of living have faded away. As if, sitting by the fire with a friend in the evening of his life, we should strain to hear the waves on the distant shore — present all along, underneath the busy hum of the everyday, but only now emerging through the murky quiet.” Minor Monuments is a quiet book, an attentive, lingering record of loss: of one’s home, of memory, of family, of belonging to a place. It is a monument that preserves small moments, the essential sediment of the memory and self, in a vivid, loving assemblage. Blair Johnson is a poet and PhD candidate in English at the University at Buffalo. Her poems have appeared in Boston Review, DIAGRAM, and Best American Experimental Writing.